I have been on a coffee steak rub kick lately. Honestly, finely ground coffee is one of the most amazing things to have on a steak. It is sweet, savory and full of flavor that you cannot get from most seasonings. 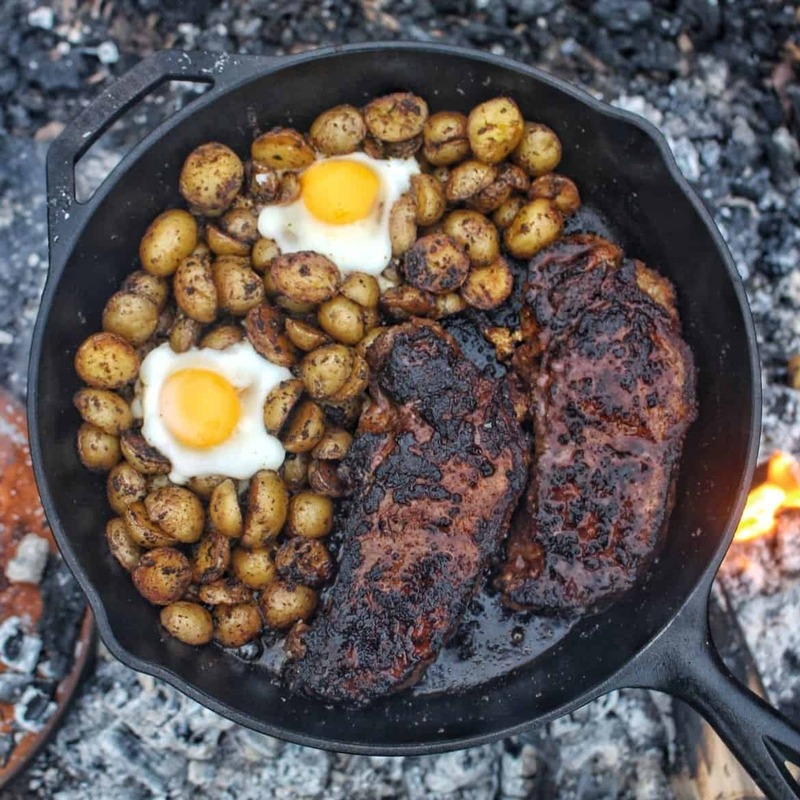 This Chipotle Coffee Rub Steak & Eggs Skillet is no exception. This coffee rub steak is super easy to make for people whose life is on the road. Most of the ingredients can be found in a common RV kitchen! I made the steak rub into a breakfast skillet as well because I always wanted to try coffee rub steak in the morning. Turns out it pairs really well with eggs, potatoes and more coffee! First you are going to cook the potatoes in the cast iron over the fire. Potatoes take about 10-15 minutes to fully cook. Moreover, you will put that skillet to a multi-purpose use. As the potatoes are finishing, you will add the steak to one side of the skillet and cook till its done. 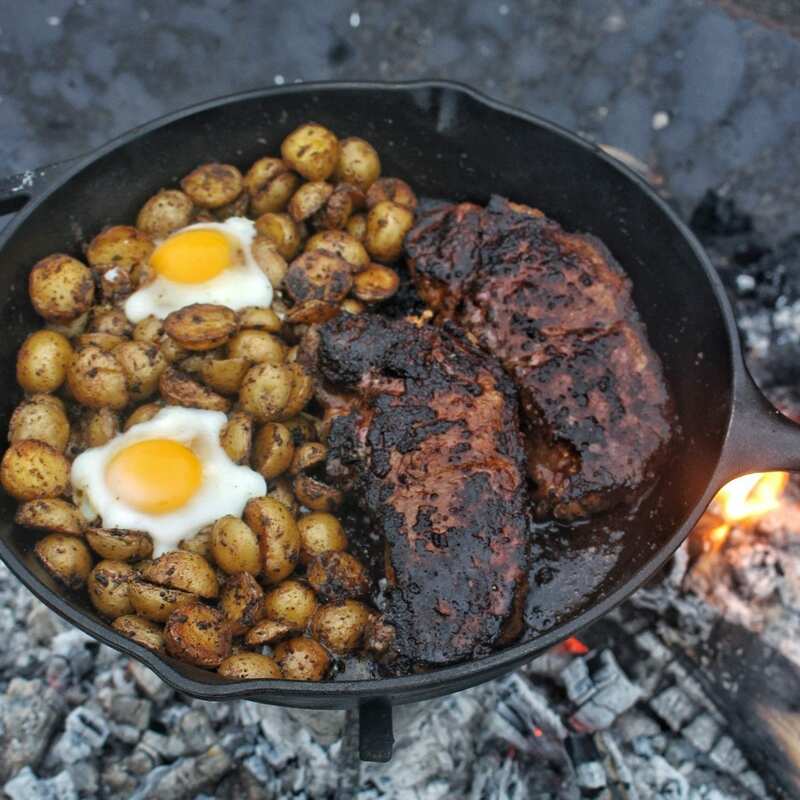 As the coffee rub steak is cooking, I topped my potatoes with some eggs and then covered the skillet. Cook for another 5 minutes and everything should be ready to go! Only tip here is to pull that coffee rub steak off of the skillet once it is done. If you let it rest for 5-8 minutes, then you will keep the juices inside from cooking fully. Top you Chipotle Coffee Rub Steak & Eggs Skillet with some parsley and you are ready to eat! Enjoy! Related Recipe: Try another breakfast skillet! 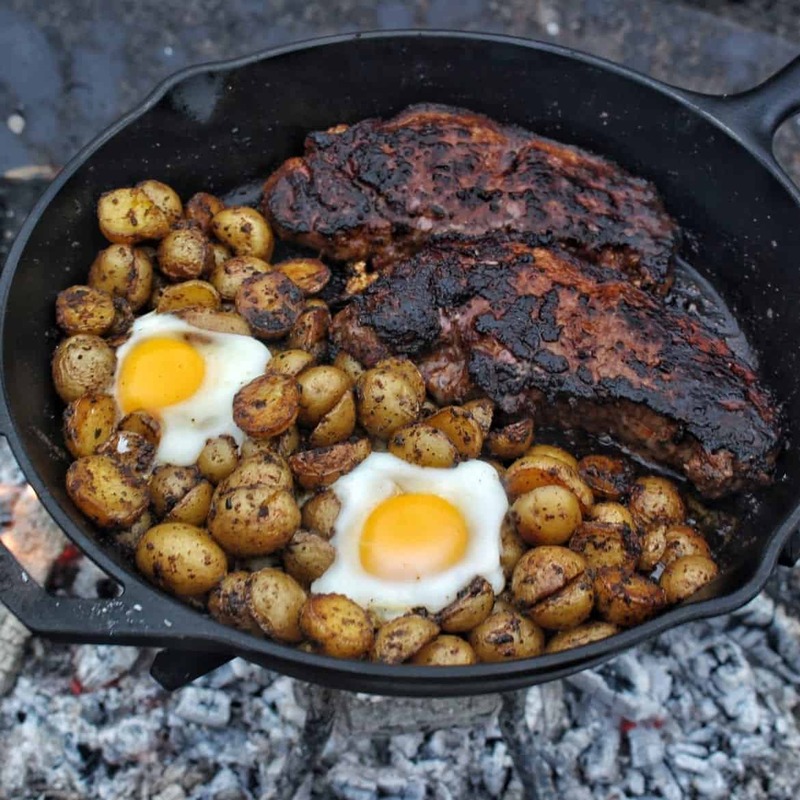 Combine your love for coffee, eggs and steak into on skillet with this recipe. Savory and sweet with a little bit of spice! Add olive oil, potatoes and my Chipotle Garlic Rub to skillet and let cook for about 10 minutes. Stir occasionally. When steaks are flipped, make 2 divots in the potatoes. Add butter to the divots, and crack the eggs inside. Let cook for 4 minutes. Cover skillet it needed. Equipment Needed: Chipotle Garlic Rub, Fire pit/grill, cast iron skillet, spatula, wood, knife, cutting board and fire starters. Any suggestions on type of coffee roast to use? I tend to like medium roast to drink but haven’t cooked with coffee and am not sure what to use. I prefer a medium roast like a Guatemalan or Costa Rican!